For its first AM2 motherboard, Abit has opted for NVIDIA's nForce 570 SLI chipset. As the 'SLI' in the board's name suggests, it supports twin graphics cards from Nvidia, defaulting back to x8 operation when actually running both cards. Abit has included the necessary bridge, plus a supporting arm to stop this coming loose when in transit - a nice touch. The rest of the package is similarly well presented. There's the usual gamut of cables to make the most out of six RAID ports, while a PCI bracket boasting USB and FireWire ports boosts connection options further. There are no surprises in benchmarking, and system stability is good. The feature set is reasonable, and there are no problems with the design - despite the KN9 being packed with features, there is plenty of room around the core components. 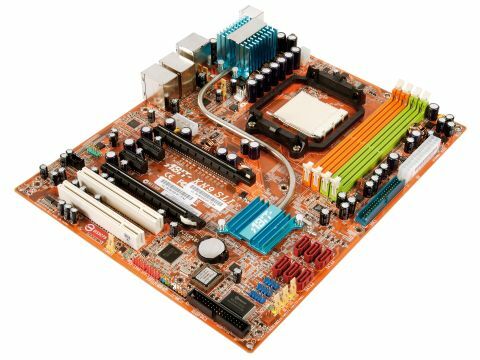 It's an impressive motherboard at a reasonable price.